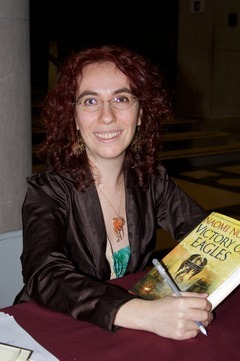 Naomi Novik, winner of the John W. Campbell Award for Best New Writer in 2006, is author of the Temeraire series, the first book of which, His Majesty's Dragon, was a Hugo finalist and winner of the 2007 Compton Crook Award. Her new novel, Uprooted, is coming out this May and the next volume in the Temeraire series is expected in 2016. She is also a founding board member of the Organization For Transformative Works, a non-profit that advocates for the transformative and legitimate nature of fan labor activities, including fan fiction.